Flyers don’t just call a customer’s attention—they can easily shift their focus to your business and what it has to offer. 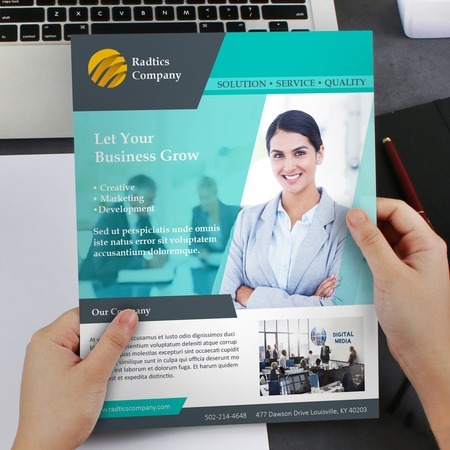 Business flyer printing has been used for decades to inform both loyal and potential customers of retail, real estate, and restaurant products and services. Promotional flyers are also used to announce major changes such as a new store branch or address change. They are also easy to hand out in high foot traffic areas, letting you target specific audiences. We offer three kinds of paper stock and two cardstock options. The choice will depend on your preferred material thickness and the distribution method of the marketing flyers. 70 lb. paper is the thinnest paper type, with the same feel and weight as notebook paper. Recommended for those that will hand out bulk flyer quantities in high traffic areas. 80 lb. paper has the same weight as magazine paper, providing more durability than 70 lb. paper. The best choice for those who want the flexibility and ease of lightweight paper but with additional durability. 100 lb. paper is the thickest paper option available and able to withstand handling. It has the same thickness as coffee table book paper, making it suitable for handing out at small events. Customers can keep the flyer for future reference. 10 pt. cardstock is much thicker than paper but still foldable. This material is normally used for postcards and greeting cards. Recommended for business flyers to be given away at store openings and small conventions. 14 pt. cardstock is our sturdiest and toughest material available. Its weight is normally seen on door hangers and postcards that are put on display. Works best for flyers that will be displayed at cash registers or in waiting rooms. We also recommend this material for business flyers that aim for a professional and premium look. Your coating option determines the finish and feel of your business flyer design. Here’s a quick guide on what to expect from the four available options. Matte gives your custom business flyers a smooth, subdued finish. It works best on designs that balance large images with lengthier text. Gloss adds that extra pop to your flyer design’s colors. Expect an added sheen to the surface that reflects under a light. It is similar to the finish seen on magazines. High gloss UV is shinier than gloss and provides the highest reflectivity. It is able to withstand frequent handling and is resistant to abrasion, thus recommended for flyers that will be distributed outdoors and at large events. Uncoated is available for our 70 lb. paper and 14 pt. cardstock. No additional shine or touch is added to make the surface writable with a pen or marker. For more information, check out our comprehensive guide on paper, cardstock, and coating options. Whether you’re opening a new store, announcing a real estate company development or launching a product line, business flyers let you communicate immediately to your target market. We also offer folding options for those that need to store and transport flyers to several locations. You can also read our post on the difference between flyers and brochures if you are considering folds for your flyer design. Start business flyer printing with us today. Upload your file online or use our flyer design templates to get you started. Select our free proof option so you can check on the file before we proceed with printing. What is the most durable paper type available? The 14 pt. cardstock is our thickest material among our paper and cardstock options. It lasts longer compared to the others with a weight similar to standard business cards and luxurious looking invitations. What does the "printed side" indicate on the online calculator? Flyers are normally read from one side but you can add more information by printing on the front and the back. Printing on both sides lets you maximize the space available and expound on lengthier information such as a product line or several services. How can I effectively design my business flyer? Keep the design focused without losing its appeal. The overall look shouldn’t be too busy and should lead readers to your main image and headline. Use a readable font and high resolution images. Flyers are quickly scanned so a pixelated image and a confusing font will lose a customer’s interest. Get straight to the point. Your announcement or discount offer should be immediately seen. Use a call-to-action to entice customers and to build interest in your brand. Does the printing time include shipment to my address? Printing refers to the number of days for producing your order. We can print your order in 1 business day. To find out when your flyers will arrive, input your ZIP code after selecting “Estimate Shipping Cost and Delivery Date” on our online calculator. What is the advantage of adding bundling to my business flyers order? Bundling seals your flyer order in sets of 25, 50, or 250 pieces. This allows for quick counting and distribution when you receive them. A clear plastic film is used to wrap around each set and protects the flyers from damage during shipping or storage.